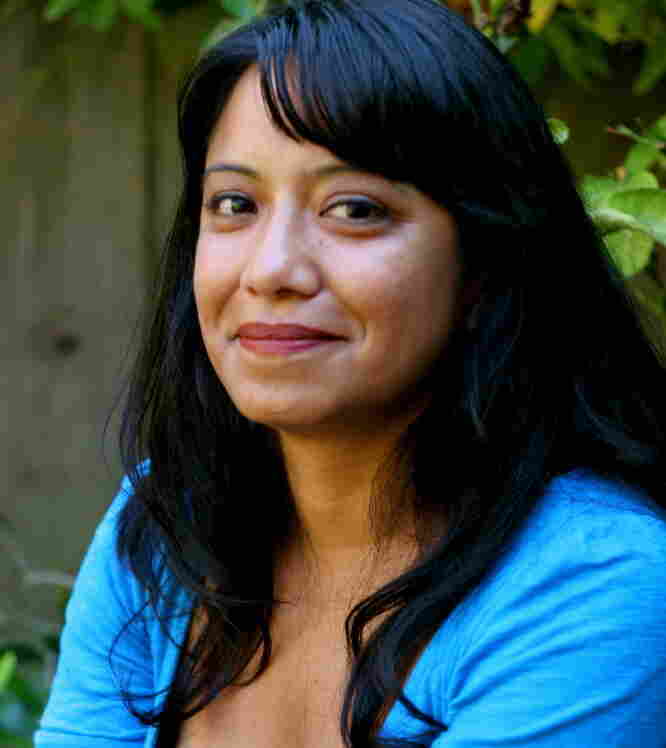 Author Malin Alegria Finds Star Status With 'Estrella's Quinceanera' In 2006, Malin Alegria's debut novel was unique in the world of young adult fiction: It followed a Mexican-American girl through a quintessential coming-of-age experience — the quinceanera. Today, Alegria's book is still celebrated in Latino communities — and publishers are starting to pay attention. Malin Alegria lives in San Jose, Calif., where she teaches and writes. Writer Malin Alegria's first novel, Estrella's Quinceanera, covers familiar territory for anyone who has ever been a 15-year-old girl battling with her mother — but the fact that the book's sassy protagonist, Estrella Alvarez, is Mexican-American makes her unique in the world of young adult fiction. Alegria's book follows Estrella through that quintessential coming-of-age experience for many Latinos — the traditional party that happens when a girl turns 15. Seduced by her new friends' luxurious lifestyles, Estrella becomes embarrassed by her home, her family and, most of all, the quinceanera birthday party her aunt and mother insist on throwing her. Estrella's Quinceanera came out in 2006, but it has found enduring success in the country's Latino communities. So much so, that Scholastic has commissioned her to write a four-book series for Latino teens, the first installment of which comes out in May 2012. 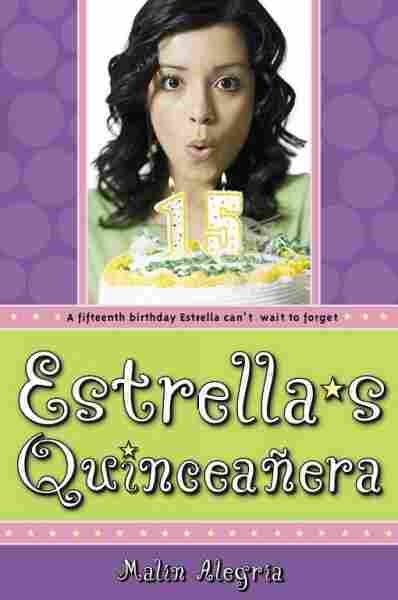 The original idea for Estrella's Quinceanera came when a publishing house commissioned Alegria to write a book that would reach Latino teens. But some of the archetypes dreamed up by Alegria's non-Latino editors sounded like they'd been dreamed up by, well, non-Latino editors. For instance, they described a character from New York's Upper West Side who sounded Dominican but whose family owned a Mexican restaurant. Alegria says that to a certain extent, she knew she had to work with the stereotypes the publisher gave her. "There were some details that I accepted from them and others that I totally ignored," she says. "I thought that if I was going to write a quince story, I was going to just write the craziest story I could think of, with the girl having to wear a secondhand dress that was her cousin's that was made in Tijuana. ... Her family was forcing her to do this, but she really didn't want to." For someone raised by radical Chicano parents in the '70s, Alegria is sanguine about the compromises she made in her collaboration with the publisher. She says she tried to be as subversive as possible, inserting references to Cesar Chavez and Aztec dance, while still making sure to write with mass audiences in mind. "I had this cholo cousin in El Centro," she says, "and he called me and said, 'Ay, Malin, I saw your book at Walmart! You're right by the washing machines.' I'm like, 'Yes! Walmart!' "
It's one of the best placements an author can get, especially if he or she is trying to reach rural communities that don't have many brick-and-mortar booksellers — or e-book buyers. Today, Alegria enjoys overwhelming grassroots support. Around the country, librarians and teachers raise money so their Latino students can experience literature — and authors — with a familiar story. They fly Alegria in to speak to auditoriums and libraries packed with students. She dresses up in a ruffled quinceanera dress, white gloves and a tiara, and acts out the book's characters for her readings. In small Texas border towns like McAllen and Pharr, Alegria gets a rock star's welcome — an uncommon experience for any author who isn't J.K. Rowling. She's greeted by handmade posters and school marquees trumpeting her visit. The readings are organized by people like Nora Galvan, a library coordinator for the Pharr-San Juan-Alamo Independent School District in South Texas, which is about 98 percent Latino. Galvan says boys and girls pile into auditoriums and libraries for a chance to see Alegria read from her book. "She actually talks to the kids about what inspired her to be an author, and what the process of writing is, which is one of our assessments here in the state of Texas," Galvan says. "Then she talks about her experiences and how they can put that into words, and how they can become authors if they so desire." A recent Northwestern University study found that the print reading habits of young people of color are virtually the same as whites. But Galvan says many of her district's students are reading below their grade level — and most are bilingual. They're hungry for stories like Alegria's — stories that reflect their language proficiencies. "Every other word is Spanish, English, Spanish, English: 'Mama, voy a mi house,' 'I wanted to go en mi carro,' " Galvan says. "The way [Alegria] writes is the way we speak in this area." Some of Alegria's chapters open with a glossary that, with a wink, introduces words and phrases that are common to bilingual kids like 13-year-old fan Amanda Cevallos: "Like, chola; the definition was like, 'big hair and hoop earrings,' which is kind of true," Cevallos says. "I just never find that in a book, so it's pretty cool." Cevallos is part Dominican and part Mexican. She has navigated diverse groups of friends in both public and private schools in the San Francisco Bay Area, so there aren't many mainstream representations of Latinos that resonate with her cross-cultural experiences — and that's not so different from how things were 10 years ago. Back then, Latino stereotypes prevailed in pop culture, with its womanizing machista fathers and its bad boy cholos. Alegria's parents had tried to counteract those stereotypes by immersing their kids in indigenous culture, but she says that as a kid, she was ashamed to tell her parents that it was difficult for her to share their sense of pride. "I was embarrassed of living in the Mission District ... growing up feeling too dark for the boys to like, or that my clothes were not new enough," she says. "All of these insecurities are what I use in my writing now ... to educate and also affirm for young kids that it's OK to shop at the flea market and have parents who are working-class and to be dark-skinned and still love yourself." Such affirmations weren't available to Alegria back in the day — at least not on her bookshelf, where the alpha blonde characters of Sweet Valley High reigned supreme. "I really believed that that is what American life is like: having blonde hair, having a twin sister, having a cute boyfriend with a red convertible," Alegria says. "And I needed to have this experience to be an American." Now, Alegria has found a powerful vehicle to help her write the Latino-American experience. Her upcoming Scholastic series, Border Town, follows the lives of teenagers living in the fictional town of Dos Rios, Texas. It's going to be pretty similar to Sweet Valley High, she says, "but with brown kids." Alegria didn't set out to be a writer. But she says when young fans tell her that they recognize themselves in her stories, it feels like she has arrived at her calling. This, she says, is why her grandmothers crossed the border. Nishat Kurwa is a reporter for TurnstyleNews.com, an online news service from Youth Radio.